Exhibition runs April 13 – May 22. Philadelphia, PA – The Center for Emerging Visual Artists (CFEVA) is pleased to present Drawing Conclusions an exhibition by CFEVA LandLab Artists in Residence. The exhibition will be on view in CFEVA’s gallery April 13 to May 22. There will be Artist Talks and a Reception on Thursday, April 30 from 5-7pm. There will be a closing reception featuring botanical cocktails by WE THE WEEDS on May 22 from 5-7pm. Gallery hours are Monday through Friday, 11am – 5pm and by appointment. Drawing Conclusions features the work of LandLab Artist in Residents Jake Beckman, Leslie Birch, Hagan/Mills/Mills and WE THE WEEDS. This exhibition focuses on the results of each artist’s installation at the Schuylkill Center for Environmental Education and how the outcomes of their residency inform ecological restoration issues. Each artist will present the results of their installations, including documentation of the evolution of their installation over time, data collected and how their artistic process is influenced by the residency. LandLab is a unique artist residency program that operates on multiple platforms: artistic creation, ecological restoration and education. A joint project of The Center for Emerging Visual Artists (CFEVA) and the Schuylkill Center for Environmental Education (SCEE) LandLab offers resources and space on the Schuylkill Center’s 340-acre wooded property for visual artists to engage audiences in the processes of ecological stewardship through scientific investigation and artistic creation. Jake Beckman is a sculptor and educator living and working in Philadelphia. Jake teaches Art and Design at the Community College of Philadelphia and graduated with an M.F.A. in Sculpture from the Rhode Island School of Design and a B.A. in Art from Swarthmore College. In addition to making work that explores systems and materials that sustain our way of life through a wide range of media, Jake has had a lifelong interest in biology, chemistry and many of the other physical sciences. His work explores themes of transformation, process and legibility as he grapples with the relationship between labor, value and substance. Jake is interested in the origins of the manufactured environment, as well as a concept of the displaced and abstracted landscape; a landscape in which earth and rock are mined, crushed, sintered, shipped and recompiled into an ordered system of buildings, cities, and bridges. He uses the visual language of industry, as well as the raw ingredients of the built environment— coal, stone, ore, etc.—to explore the memory of a time when Americans were more intimately connected to the processes that constructed and sustained their material surroundings. Leslie Birch fancies herself a tech geisha in Philadelphia. Her fascination with the combination of interactive art and robots led her swiftly to electronics. An original member of The Hacktory in Philadelphia, Leslie is an authority on LED “Throwies” and Arduino microcontrollers. Her artistic practice has led her to working with Leah Buechly, inventor of the first stitchable microcontroller and winning NASA’s International Space Apps Challenge for the Orbit Skirt – a skirt that can track the International Space Station, as well as Senti-8, a wrist band that allows astronauts to experience the scents they miss. More recently, another invention, the FLORAbrella, has garnered attention around the world as a color sensing umbrella that can match clothing and do rainbow patterns. Currently Leslie creates projects and tutorials for Adafruit, a DIY electronics company in New York promoting education. She can also be found blogging about wearables for both Adafruit and Element 14. Her hangout is Hive76, a hackerspace promoting open source hardware in the Spring Garden area. When not hacking hardware, Leslie shares her tech love through speaking engagements, teaching at the library’s MakerJawn program and planning events like LadyHacks. Her free time is spent hiking, camping, letterboxing and birding. Yes, she loves Star Wars and you can follow her @zengirl2. Native Pollinator Garden provides a variety of native blooms that follow three full seasons of succession. This provides forage for several generations of pollinators each year. The beds are constructed of chemical-free Douglas fir, are filled with a blend of organic, local soil and leaf compost, and are planted with native, organically grown plants from a local nursery. Native Pollinator Garden addresses the threats posed by monoculture, non-native species’ parasites and disease, GMO’s, and pesticides. It serves as an example of the importance of local action on an individual level. WE THE WEEDS is a botanical arts collaboration headed by artist Kaitlin Pomerantz and botanist Zya S. Levy that seeks to highlight and investigate the presence of the natural world within the manmade landscape. 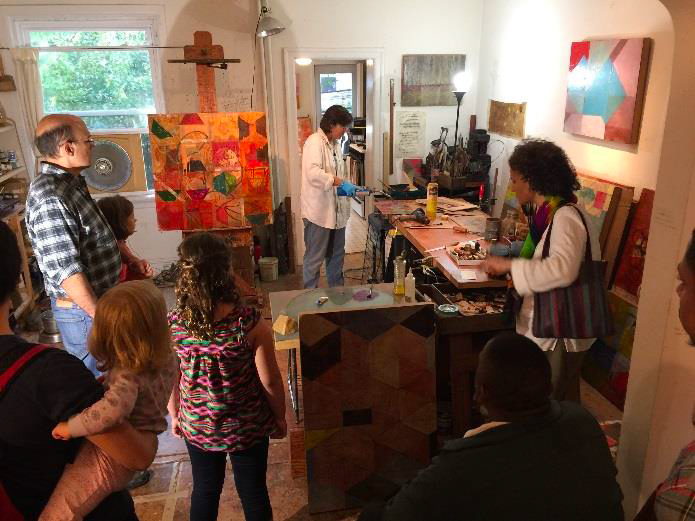 Past projects include ethno botanical tours, participatory art and science experiments, public art installations, educational outreach, and culinary and sensory plant experiences. WE THE WEEDS has worked in participation with Practice Gallery, the City of Philadelphia Mural Arts Program, the Asian Arts Initiative, and the Penn Center for Urban Research. The Schuylkill Center for Environmental Education inspires meaningful connections between people and nature. We use our forests and fields as a living laboratory to foster appreciation, deepen understanding, and encourage stewardship of the environment. The Center for Emerging Visual Artists is dedicated to coordinating a strong regional support system for visual artists, to advance the careers of professional artists in the region, to promote relationships between artists and the communities in which they live, and to increase access to and promote interest and understanding of visual art among citizens of the community. Support for LandLab is provided by the Knight Foundation, the National Endowment for the Arts, the Dolfinger-McMahon Foundation and the William Penn Foundation. This project was supported in part by the Pennsylvania Partners in the Arts program of the Pennsylvania Council on the Arts, a state agency funded by the Commonwealth of Pennsylvania and the National Endowment for the Arts, a federal agency. Support also provided by PECO. 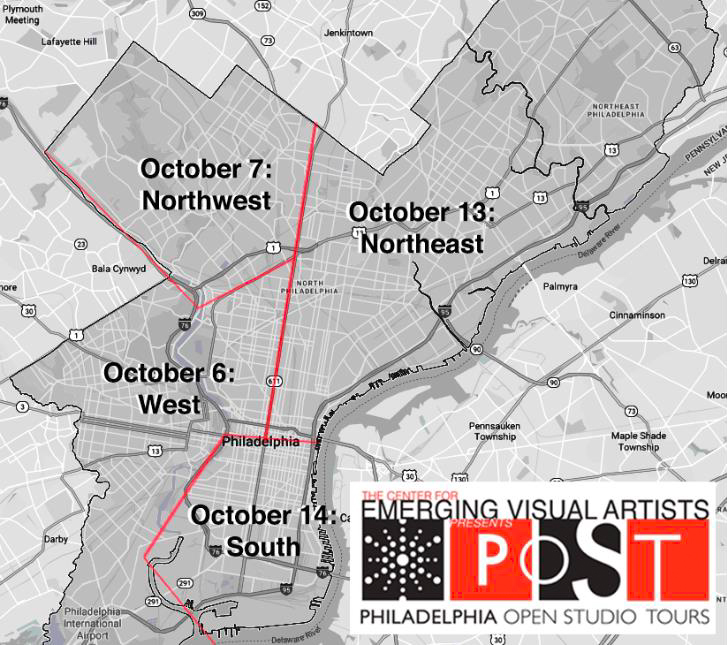 This program is administered regionally by the Greater Philadelphia Cultural Alliance. This entry was posted in Art, Art in Philadelphia, Art Spaces Philadelphia, Center for Emerging Visual Artists, Fine Art Philadelphia, Installation, Mixed Media Art, Philadelphia, Philadelphia Abstract Art, Philadelphia Art, Philadelphia Art Galleries, Philadelphia Art Installations, Philadelphia Artists, Philadelphia Sculpture, Public Art, Sculpture, Uncategorized and tagged abstract art, Art, Art Installation, Center for Emerging Visual Artists, DoNArTNeWs Philadelphia Art News Blog, Drawing Conclusions, Hagan/Mills/Mills, LandLab Artist in Residents Jake Beckman, LandLab Residency Exhibition, Leslie Birch, mixed media art, Philadelphia Art News, Philadelphia Art Shows, Philadelphia Artists, Philadelphia Fine Art, Schuylkill Center for Environmental Education, The Center for Emerging Visual Artists, WE THE WEEDS on April 10, 2015 by admin1. Currently on view through February 6, 2015, St. Joseph’s University Gallery, Merion Station, Pennsylvania. In his largest exhibition of this work to date, James B. Abbott presents a timely meditation on Cape Cod across time. Large scale, multi-image panoramas display the drama of shifting tides, dunes and seasons while more intimate prints examine the subtleties of the moors and marshes. Taken over 15 years, this collection of images moves audiences into a contemplative space where time, place and scale are in constant flux. The Landscape Before Me, is on display at St. Joseph’s University Gallery through Friday, Feb. 6, 2015. 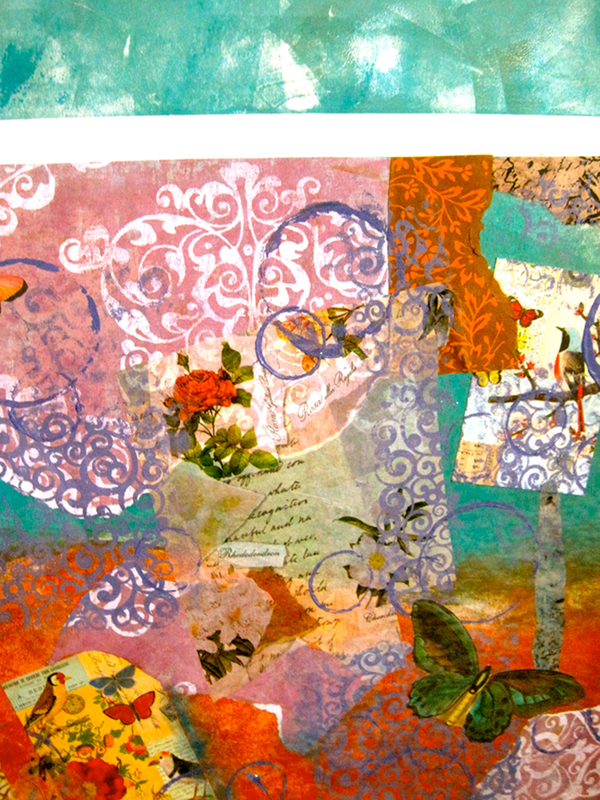 A reception for the artist will be held on Thursday, Jan. 22, from 5-7 p.m. The cross section of images presented in The Landscape Before Me is from an ongoing body of work started in 2000 in South Wellfleet, Massachusetts while the artist was vacationing with his family. The work took on full commitment after he was accepted the Outer Cape Artist-in-Residence Consortium, managed by the Peaked Hill Trust. Through volunteers, the organization facilitates artists spending two weeks in a primitive dune shack with no electricity or no running water. The shelter was 400 feet from the ocean, isolated in the Peaked Hill dunes of the Cape Cod National Seashore, and provided unparalleled concentration and immersion in the landscape. This opportunity placed Abbott in the epicenter of an extraordinary environment, gave him the solitude to think, and came with a mandate to create. With this increased knowledge and appreciation of the place, his work took a new direction with increased momentum in the years following the first residency. Abbott has returned independently over 20 times since the May 2003 residency and in the summer of 2007, was awarded a three week C-Scape Dune Shack Artist Residency. This second residency was situated in a shack in the dunes of Race Point, for an intense three week period, and provided another unique time and situation to produce work. The images are taken mostly in the Outer Cape region of the Cape Cod National Seashore in all four seasons. Abbott works with polaroid positive/negative multi-image panoramic and single wide-angle images printed and toned in a darkroom on conventional silver gelatin paper. Working in black and white allows the artist to approach the landscape without obvious tourist references, focusing instead on structure and nuance as he attempts to record a changing landscape. The ever-shifting sand dunes act as a three dimensional model as they record the primary forces and rhythm of nature. The sandscape seems to capture everything from the most minute shift of wind and tide to events of catastrophic force. The vocabulary of this landscape reflects permanence and mutability: where sea meets sky and land, where human intervention imprints the environment, and where the sky, sea and land often blend and/or mirror each other. The effects of currents of air are as evident as those of the sea in this place. At the most basic level, Abbott makes two dimensional photographic interpretations of these highly transitory three-dimensional records of natural and inflicted change. Abbott’s goal is that the work will deal not only with how one perceives a place or thing but how one thinks of that place after encountering a visual representation of it. With emphasis on simultaneous micro and macro views or layer of information, the artist exploits the inherent descriptive nature of the photographic medium. He works on long term projects in one location and usually towards complex and diverse interpretations of a subject. In many ways, his collected works form a comprehensive and sincere portrait of a place. The artist learns and builds from each trip, so that as it grows, each body of work takes on a life of its own. The work in Cape Cod is one of four long term, photo-based investigations of specific locations; he has also worked extensively in Berlin, Germany, on and around the Benjamin Franklin Bridge in Philadelphia, Pennsylvania, and currently in Florence and Venice, Italy. James B. Abbott is a photographer who has maintained a studio in Philadelphia on North Third Street since 1983 and is a resident of Ardmore,Pa. Abbott earned a degree in Photography from Cranbrook Academy of Art, interned at the Light Gallery in New York, New York and completed an apprenticeship with renowned American photographer Burk Uzzle. Abbott has served as photographer for the Stieglitz Center at the Philadelphia Museum of Art and Gallery Director of the Burden Gallery at Aperture Foundation in New York City. Abbott has held faculty appointments at Penland School of Crafts, Moore College of Art and Design, the University of the Arts, Philadelphia University, Tyler School of Art, Temple University, and currently teaching in Italy for East Carolina University. Over the course of the past twenty-five years Abbott has received many residencies and commissions; exhibited regularly; curated notable exhibitions and has built a successful international freelance photography and fine art practice. He has been a visiting artist and lecturer at Cranbrook Academy, a resident artist at the Cape Cod National Sea Shore, and lectured at the Griffin Museum of Photography in Winchester, Massachusetts. Abbott has been commissioned to create photographs for many projects and organizations including the Fairmount Park Art Association for their New.Land.Marks project, Rutgers University and NJN Public Television, and the Marriott Hotel. Abbott’s extensive exhibition history includes solo exhibitions at Harvard University, the Wellfleet Public Library, Free Library of Philadelphia, and the Lishui International Photo Festival in Lishui, China. Significant group exhibitions include the Atwater Kent Museum for the Museo Bardini in Florence, Italy, State Museum of Pennsylvania, The Print Center, and the National Constitution Center. Abbott’s work is included in many public and private collections including the Federal Reserve Bank, the Philadelphia Museum of Art and The Wharton School of the University of Pennsylvania. Abbott’s curatorial endeavors brought outstanding and stimulating work to Philadelphia through his gallery/exhibition space Exhibit 231. He put together exhibitions by Carl Toth, John Geard, Joel Katz, Geanna Merola and Sandy Sorlien. Abbott has also received a number of grants and awards for his work: he is the recipient of three Pennsylvania Council on the Arts Individual Artist Awards, a SOS grant, and an Independence Foundation Fellowship in the Arts. A solo exhibition of select images from this body of work will be on view at The Saint Joseph’s University Gallery featuring work from nearly two decades of working on Cape Cod. The Landscape Before Me will be on view from Monday December 22, 2014 through Friday February 6, 2015. There is a public artist reception on Thursday, January 22 from 6-8 pm. Saint Joseph’s University Gallery is located in Merion Hall on the James J. Maguire ’58 Campus at 355 N. Latches Lane in Merion Station, PA. Gallery hours are Monday through Friday, 9 a.m. – 7 p.m., and Saturday, 10 a.m. – 1 p.m. More at www.sju.edu/gallery or by calling 610-660-1845. Thank You to Ann Peltz at akkoivunen@gmail.com for this press release. This entry was posted in Art, Art Galleries, Art in Philadelphia, Center for Emerging Visual Artists, Fine Art Philadelphia, One-Person Art Show, Philadelphia, Philadelphia Art, Philadelphia Art Galleries, Philadelphia Art Shows, Philadelphia Artists, Philadelphia Artists, Photography Philadelphia, Uncategorized and tagged Art, Art Installation, Art News Blog, Atwater Kent Museum, Burden Gallery at Aperture Foundation, Burk Uzzle, Cape Cod, Center for Emerging Visual Artists, Cranbrook Academy of Art, DoNArTNeWs, East Carolina University, Griffin Museum of Photography, Harvard University, James B. Abbott, Lishui International Photo Festival, Moore College of Art and Design, NJN Public Television, Outer Cape Artist-in-Residence Consortium, Penland School of Crafts, Philadelphia, Philadelphia Art Shows, Philadelphia Artist, Philadelphia Fine Art, Philadelphia photography, Philadelphia University, Photography, Rutgers University, St. Joseph’s University Gallery, State Museum of Pennsylvania, Stieglitz Center at the Philadelphia Museum of Art, Temple University, The Landscape Before Me, Tyler School of Art, University of the Arts, Wellfleet Public Library on January 10, 2015 by admin1.